I recently received an email with this subject line: STOP ORDER TO YOUR TRANSFERRED INHERITANCE FUND and I am concerned that it could be an attempt at defrauding me. Let me know in the comments section what you think, please. THE ALLEGED MONETARY AGENCIES HAVE REQUESTED THE FOLLOWING DOCUMENTS TO CLARIFY THE FUND IS NOT IN CONNECTION WITH DRUG AND/OR TERRORIST ATTACK OR ANY OTHER SOCIAL VICES/MENACE. 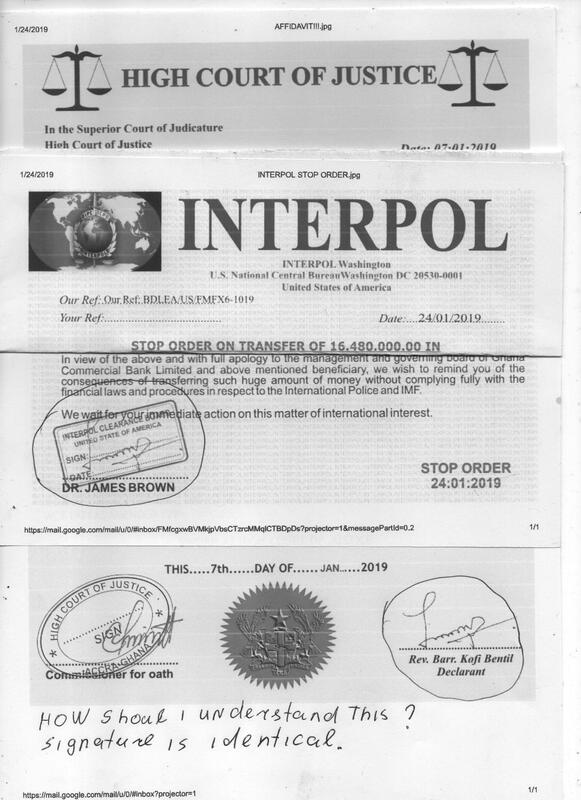 IN VIEW OF THIS DEVELOPMENT ATTACHED DOCUMENTS HAS BEEN FORWARDED THIS MORNING THROUGH THE OFFICE OF THE FEDERAL MINISTRY OF FINANCE WHICH THE PROCUREMENT OF THE REQUESTED DOCUMENTS WILL ENABLE THE INTERPOL TO GIVE THE CLEARANCE DOCUMENTATION APPROVAL THAT WILL ENABLE THE REFLECTION OF THE FUND TO YOUR BANK ACCOUNT WITHIN 24 HOURS. THEREFORE WE WILL CAREFULLY ADVICE YOU TO MAKE NECESSARY ARRANGEMENT TO TRANSFER THE REQUESTED FEE OF £14,340 POUNDS TO ENABLE THE PROCUREMENT OF THE MANDATORY DEMANDED DOCUMENTS THAT WILL PILOT THE RELEASE/REFLECTION OF THE FUNDS TO YOUR BANK ACCOUNT.